TENA Men Active Fit Pants Plus are breathable pants specially designed for men with moderate to heavy incontinence. The pants are particularly ideal for users who have a more active lifestyle. The pants feature double leakage barriers to ensure maximum absorption, providing you with extra confidence that you are protected from any leaks. 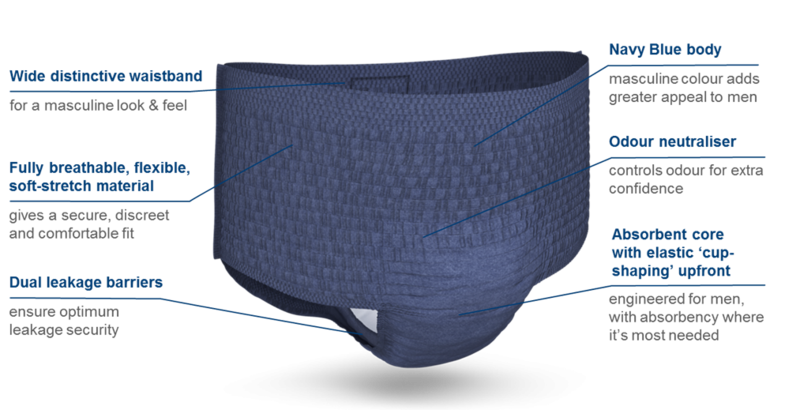 A highly absorbent core is also built in to the pants for additional protection. To ensure outstanding comfort during use, the pants have been specially designed to fit the male anatomy. A wide distinctive waistband is also featured in the pants in order to provide extra security and ensure the product fits accurately around your body. TENA Men Active Fit Pants Plus are designed with a navy blue colour to provide a masculine feel. The soft stretch material of the pants provides a comfortable feel on the skin. The material is also fully breathable, so you can ensure your skin will stay healthy whilst wearing the pants. Special odour neutralising technology is also featured in the pants, so you don’t have to worry about any unwanted odours throughout the day. TENA Men Active are an ideal solution for men who are looking for a masculine yet highly absorbent product for managing incontinence.